My name is Rosanna L. and I was diagnosed with Ovarian Cancer in December 2008 at just 25 years old. I was only married 4 months when something in my head told me to go buy a pregnancy test. I had not missed a period or had any symptoms of pregnancy but I found myself at a drug store buying a pregnancy test. (I now know God was on my side that day) To my surprise when I took the test it came out positive. I was soo excited because there was nothing more in the world than I wanted than to become a mother. I immediately called my GYN and made an appointment. Going into his office I was both nervous and excited. They took another test there……….positive again!! The doctor drew blood just to make sure I really was pregnant because I was not having any symptoms. Three days later I went for another blood test and then the following day for the results. Was I really pregnant?? To my shock the doctor said my HCG levels were elevated but they had dropped so he assumed it was a miscarriage. He told me to come back in three days for another blood test. I was devastated!!!! How can I miscarry?? Well, the next day I started feeling slight pain on my left side. Going back to the doctor he immediately sent me for an emergency ultrasound. Well that was the start of it all! The ultrasound showed 2 tumors on both of my ovaries and 1 on my uterus. I was then sent for a CATScan to confirm these findings. Going into my doctor’s office and hearing the words “We think it may be Ovarian Cancer” was something i never thought I would hear. My life literally flashed before my eyes. After seeing 2 different doctors I decided to go to Memorial Sloan Kettering in Manhattan. There the surgeon told me it looked like Stage 3 Ovarian Cancer and I would need surgery to remove the tumors. So on December 4th 2008 with my husband and parents at my side I went in for surgery. That is the day I became infertile. The surgeon had to remove both ovaries but luckily he saved my uterus. He told me I would need chemo just as a precaution because it was Stage 3. I began chemo on January 12th, 2009. My long beautiful hair began to fall out! I was determined to finish chemo and become a survivor!! My last round of chemo was on March 27th, 2009 and on April 20th, 2009 I was told I was in remission!!!!!! “My name is Dorine Ricciardi and I was 44 years old when i was diagnosed with Ovarian Cancer stage 1c in November of 2003. It is funny I can’t remember dates for anything but I can tell you the exact date that I was diagnosed. I had a full hysterectomy my CA125 was 825 at the time of surgery. I had the taxol/carbo, then I went into remission for 3 1/2 years. Was feeling great then all of a sudden I knew that it was back…and it was full force. I had my 2nd surgery in July of 2007 had chemo the cocktail was gem/carbo and I have had a pulmonary embolism in 2008 due to the cancer. I am still battling this beast and I will never give into it oh hell no. In July 2010, I started feeling soooo tired. I would get out of bed in the morning and just lay on the couch most of the day. It seemed like I had no energy at all. Instead of going to the doctor and having to wait for test results, my husband took me right to the emergency room. We were there from 8:30 in the morning until about 8:30 at night. They ran tests and scans and more tests and finally gave me all the results. 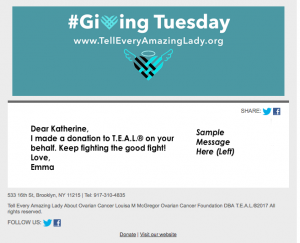 I had ovarian cancer. I was devastated, to say the least. I had never been sick before in my life. My daughter and future son-in-law were getting married in Jamaica in April 2011. I had a 5 year old grandson. I wondered — would I be able to go to the wedding . . . would I get a chance to see my grandson grow up. ??? The next few days were spent on the phone, making appointments and going to doctor offices. I ended up at the Cancer Institute of New Jersey. My doctor there was wonderful. I knew she would take good care of me. I had surgery August 16, 2010 and started chemo about 2 weeks later. My goal was to get better for my daughter’s wedding. I did make it to my daughter and son-in-law’s wedding in Jamaica. I had only 2 more chemo sessions to face when I got back. But my blood work when I got home showed that my body couldn’t take any more chemo. My doctor sent me for a PET scan and said the results would decide if I’d need more surgery or radiation. But the scan came back clear. I was cancer-free!!!!! This past summer, I babysat for my grandson every day and was able to make many happy memories with him. I am so grateful to my doctor and the whole team at the Cancer Institute of NJ. I am so grateful for my husband of 31 years. I truly could not have made it through the treatments without him. I am grateful to my family and friends who were so supportive and encouraging. I was truly blessed to be surrounded by such wonderful people.